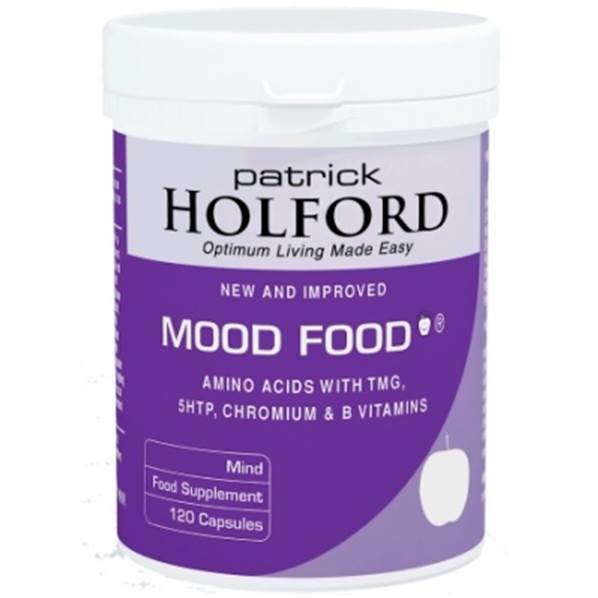 Mood Food® Formula is a unique combination of nutrients which play synergistic roles in normal brain function and may help support nervous system activity. Tyrosine and DL-phenylalanine support the body's production of important 'feel good' brain chemicals, while 5-HTP, a naturally occurring amino acid, and a range of vital B vitamins are also included to help support neurotransmitter production and balance. Two capsules taken once or twice daily on an empty stomach, with a starchy meal or snack, or as professionally directed. Caution is advised in cases of melanoma, mania or high blood pressure. Not to be used in conjunction with mood modifying drugs. Contains phenylalanine. Rarely digestive discomfort can occur which may be relieved by reducing the Nutritional Supplement Recommended Intake. Dl-phenylalanine, L-tyrosine, Trimethylglycine, Capsule Shell (Hydroxypropyl methylcellulose), Pantothenic Acid (Vitamin B5 as Calcium Pantothenate), Griffonia Simplifica Seed Extract (Providing 5- HTP), Niacin (Vitamin B3 as Nicotinamide), Vitamin B6 (as Pyridoxine Hydrochloride), Folic Acid and Vitamin B12 (as Cyanocobalamin).